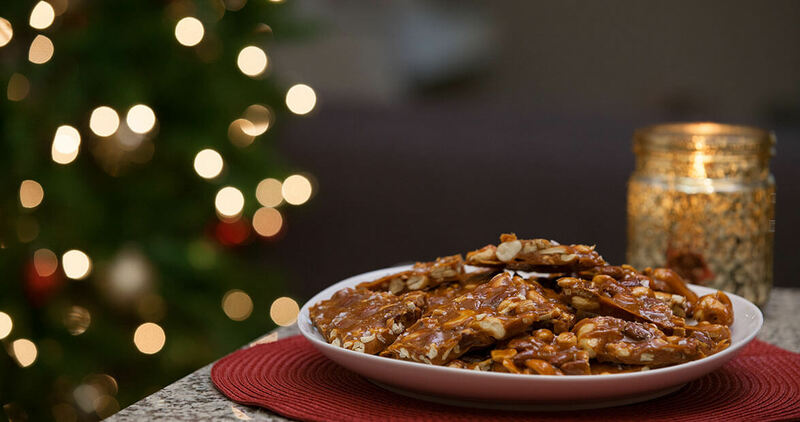 This spiced nut brittle is a lovely treat for gifting or snacking. The chai flavor profile gives it a unique kick, and Maldon sea salt is the perfect finishing touch. Spray a 10×15-inch rimmed baking sheet and the back of a spoon or an offset spatula with cooking spray; set aside. In a large saucepan, bring the sugar, water, butter and corn syrup to a boil over medium-high heat. Stir occasionally. After about 10 minutes, when the mixture has caramelized to light brown and registers 300° on a candy thermometer, remove the mixture from the heat and carefully stir in the cinnamon, cayenne pepper, cardamom, and baking soda. The mixture will bubble up. Stir in the nuts, then immediately pour the brittle onto the prepared baking sheet. Use the back of your greased spoon or offset spatula to spread the brittle into a thin, even layer. Sprinkle with Maldon sea salt. Let cool completely, at least one hour. Break the brittle into large shards and serve. Store in an airtight container.